Around 300 years ago, Juan Famenia Floris created his first fragrance and recorded the formula in a large leather bound book. He continued to craft individual blends for his distinguished customers and with each new fragrance the original formula was handwritten in this very book. For three centuries these recordings, along with the many more that followed, have been meticulously cared for in the vaults at 89 Jermyn Street and handed down through each generation of family, providing inspiration for the unique Floris fragrances created today. Using the knowledge and expertise handed down over centuries; the eighth and ninth descendents proudly continue the family’s work creating exquisite perfumes for stylish generations to stand the test of time. 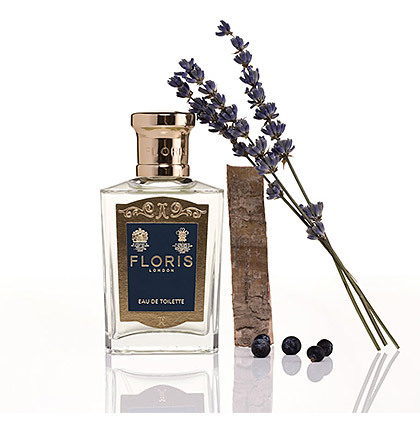 Floris is a London-based perfumery house that has been in operation since 1730 and continues to be run by descendants of the founders. Originally founded by Juan Famenius Floris and his wife, Elizabeth, Floris sold grooming and shaving products as well as perfumes from their 89 Jermyn Street location. They received a Royal Warrant in 1820 as "Smooth Pointed Comb Maker" to King George IV. Royalty, historical figures and celebrities have long been customers of Floris, whose famed clientele includes Florence Nightengale, Winston Churchill, explorer Sir Ranulph Fiennes and actress Marilyn Monroe. In 1878, Mary Anne (Floris) Bodenham and husband James took over the business from Mary Anne' brother, Joseph Floris. Bodenham and Floris family descendants still operate the company today. Production and sales continued at the 89 Jermyn Street location until 1989, when a factory was opened in Devon. The Jermyn Street location continues to be the company's headquarters and flagship store. Floris today offers fragrances in four collections: Men's fragrances, Women's fragrances, the Classic collection and the Private collection. The company also offers bath and body care products to accompany its fragrances.